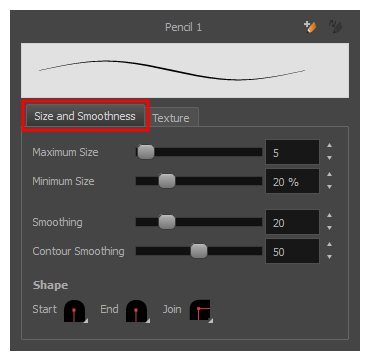 You can configure a pencil's size, how much Harmony should automatically smooth your pencil lines when drawing, the shape of the tips and corners of your pencil line as well as its texture. The Pencil Properties dialog opens. Use the Maximum Size slider to set the maximum size of your pencil line. If you are using a pressure-sensitive pen tablet, use the Minimum Size slider to set the size of your pencil when using your pen with very little pressure. The minimum size is set to a percentage of your pencil's maximum size, which is 20% by default. If you don't want the pressure on your pen to affect the pencil size, set this parameter to 100%. Click on the Shape pop-up buttons to select whether you want the Start and End of your pencil lines to be Round or Flat, and whether you want the points and corners where pencil lines Join to be Round, Mitre-shaped or Beveled. Click on the Texture tab. 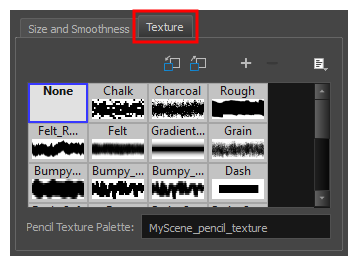 If you want your pencil line to have a texture, select the desired pencil line texture from the pencil line texture library. Otherwise, select None. For more information on pencil line textures, see About Pencil Line Textures. Either close or set aside the Pencil Properties dialog. In the Camera or Drawing view, start drawing to test your pencil settings.